I originally wrote this article for NLGJA News. Apparently Rachel Maddow is so far out of the closet she’s out of mind. As the news broke about CNN’s Anderson Cooper formally coming out, Twitter erupted and columnists began posting. Two main narratives took shape quickly: 1. Well, duh! and 2. Is this relevant? Oh yeah? What about CNN’s Don Lemon? MSNBC’s Thomas Roberts? Or Steve Kornacki who co-hosts at 3 p.m. for MSNBC. Or what about Jane Velez-Mitchell from Turner’s HLNTV? Or how about MSNBC’s Rachel Maddow? Later in the day, the headline was changed to add “Prime Time” and a correction on the post was added to point out that the original version omitted Lemon and Roberts. But while it might be simple to change a headline, or offer a correction, it is not so easy to change the original impression that there are no lesbian anchors on Network and Cable television. Forbes argues that Maddow isn’t officially designated as an anchor. So I guess she doesn’t count. And they didn’t even mention Velez-Mitchell who CNN calls an anchor. I get that Cooper is a household name and reporting on what they consider a “First” is more exciting than reporting on the “Fifth” or “Sixth” or “Yet Another”. I get that discussions about whether journalists should be out (in their newsrooms and the world) are important. And his coming out did lead to a lot of these types of discussions and the impact they have on the way we cover the news. One of the most important things NLGJA can do is help young journalists navigate these waters. Yet, what does a young LGBT broadcaster learn from the past week? Well, it may just depend on whether that broadcaster is a young woman or a man. A young gay woman may come away from last week thinking that no matter how hard she works as a journalist, no matter how she proves herself or what job she lands, there is something about her being either a woman or a lesbian that will make her invisible. And I’m thrilled to be able to talk about social media to a group of high school teachers who are taking on the task of teaching budding journalists. I know that schools can be nervous about social media and some school districts don’t have the resources to jump into journalism in the same way they may cover other subjects and activities, but this group of 35+ teachers chose to spend a chunk of their summer in balmy Arizona learning about new tools and tactics from faculty and staff at the Cronkite School of Journalism at Arizona State University. More power to them. I’m posting this so they can easily carry these tools home with them. This presentation was part of that session given to high school journalism teachers, part of the ASNE Reynolds Fellowship in Phoenix in the summer 2012. Here’s the Social Media for Journalists handout for this class. And below are some more resources. These are the links that appear on the final slide of the presentation. The Kiplinger program offers short-term fellowships to help make better use of new online tools. This one’s about a week and we’re talking social media, personal branding and cutting through the clutter. I know it’s going to be crazy fun and I’ll have much more to say after I meet everyone. But this post is to share the resources and tools from my talks. RESOURCES: The slides below are for this week’s sessions. And here are more resources about personal branding: JAWS Branding U. That’s a blog I put together in the fall for JAWS Camp – a conference for women journalists. There is lots more at that page on personal branding. And there we go. It was a great couple of days in Ohio. The Kiplinger Program was wonderful. I leave feeling a little jealous of the fellows who will be together the rest of the week. But I’m headed home. 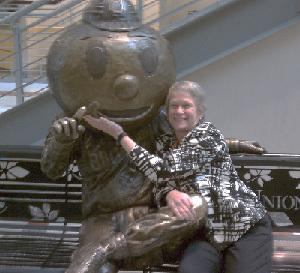 I made many friends at Kiplinger including Brutus Buckeye. 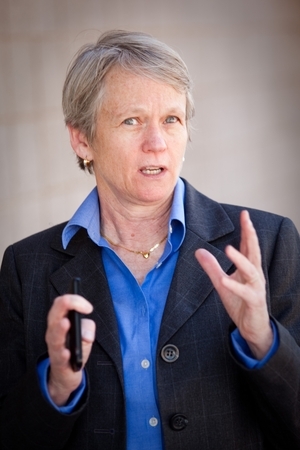 I always learn something new after a presentation – either about presenting, teaching, sharing. Or I have an insight about the topic. Two things stand out from yesterday’s session. 1. Everyone truly does have some unique wonderfulness inside. And until they get comfortable with whatever that is, it doesn’t matter what they are trying to do with the stuff around the edges. 2. Don’t forget to fill my pockets with breath mints. 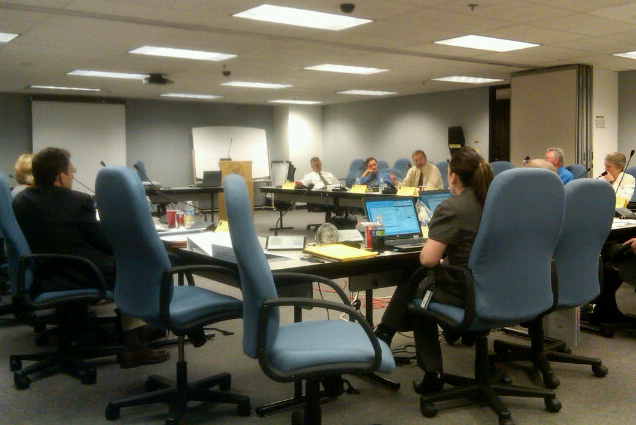 AZ courts social media committee kicks off: A super smart judicial meetup. I’m a member of the Arizona Courts committee on impact of technology and social media on court proceedings (say that 3 times fast). Day 1 was fascinating yesterday. We outlined issues – everything from cell phone use in court to safety issues for witnesses, victims, jurors and undercover police officers to people friending rural judges on Facebook. It was a great conversation led by Arizona Supreme Court Justice Robert Brutinel who did what Supreme Court justices do so well – he asked questions, proposed hypotheticals and acted as devil’s advocate. The room was filled primarily with judges from around Arizona who recognize that times are changing. In this photo — I am on the far right in a white jacket. And on the left is David Bodney managing partner in the Phoenix office of Steptoe & Johnson LLP, where he practices media and constitutional law. David and I are at opposite ends of the spectrum of social media use. But we are both there to add our professional thoughts and keep an eye on the role of journalists in the courtroom. This is going to be an interesting year. I’m hosting #ConnectChat today to talk about social media for business journalists. Bottom line: It’s a lot like social media for all journalists … just with more money. Stop by – #ConnectChat – from noon Pacific time. Or come back later. I’ll link to the archive. #ASNEchat on the best free or inexpensive online training. I was asked to join a panel of newsroom trainers to talk about journalism training and answer questions about what journalists want, need and can find inexpensively, primarily on the web. Panelists: Charles Apple, freelance journalist and blogger; Matt DeRienzo, Journal Register Co.; Howard Finberg, Poynter; Deborah Gump, Middle Tennessee State University; Evelyn Hsu, Robert C. Maynard Institute for Journalism Education and Robin Phillips, Reynolds Center for Business Journalism. 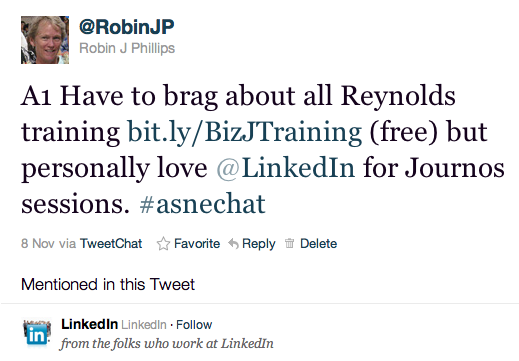 Here’s the full collection of #ASNEchat Storify archives. And Steve Buttry has pulled together an extensive list of Resources for Training Journalists.